Slava is a young man with mischievous smile and effervescent personality; you’d never guess he was once a shy teenager who spoke no English. His previous success at Mercy Centre’s School is a point of pride for the staff and Slava’s parents. By the time he turned 22 and joined Mercy Centre’s Adult Services, Slava was fluent in English, an enthusiastic fan of the Patriots, the Red Sox and the Bruins, and excited at the prospect of being qualified to earn a paycheck. 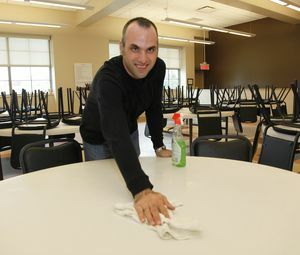 As a young adult, Slava initially participated in Mercy Centre’s Group Supported Employment Program which teaches job skills and provides onsite job training and supervision at several local businesses including Eaton Corporation’s Worcester facility, Anna Maria College, Calabria Ristorante, St. John’s soup kitchen and various cleaning sites in the community. Participants earn hour wages as members of cleaning crews. They work in groups on small assembly projects and handle mailings for local businesses and non-profit organizations. “We provide one-on-one coaching for participants on how to interact with other people. They learn to be a member of a team, follow instructions, complete a job and be responsible,” says Bruce Nelson, Senior Case Manager. Slava and his fellow crew members from Mercy Centre sweep and mop floors, wipe down counters and take out the trash. This behind-the-scenes, but vital work, enables St. John’s to offer clean and safe accommodations to some 400 homeless people who eat there every day. It’s empowering for Mercy Centre participants to see that their work is valued beyond the paychecks they earn.